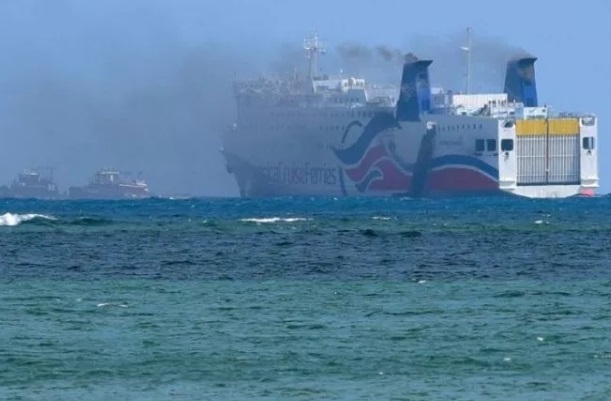 The ferry Caribbean Fantasy with 511 passengers caught fire on 2 nautical miles north off San Juan Harbor, Puerto Rico. The fire erupted in engine room and spread to other compartments on board. Smoke billowed from several parts of the large ferry Caribbean Fantasy. The crew reported immediately about the accident and Coast Guard dispatched rescue teams to evacuate the distressed passengers. An inflatable orange rescue slide was activated and people were transfered to life rafts through them. All the 511 passengers, including crew were evacuated without injuries and were transported to the shore in good health. 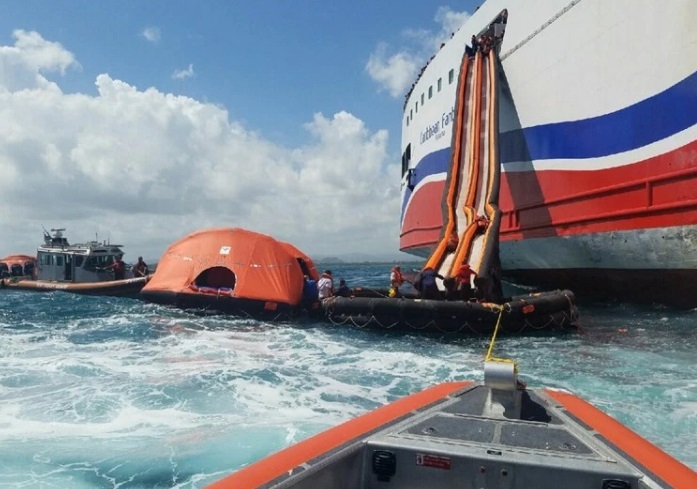 “Everyone has been safely removed from the ship”, reported the Coast Guard after completion of the passengers evacuation. “There were no reports about injuries”, adds the statement. 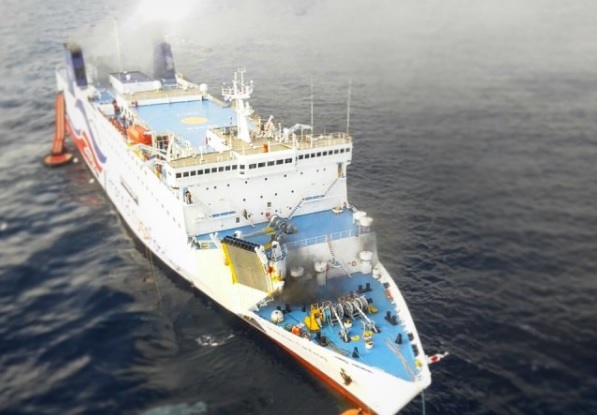 The firefighting and salvage of the ferry Caribbean Fantasy was started by multiple air and surface crews. Firefighting tugs and airplanes assisted with getting control of the flames. The ship remained adrift during the salvage and later grounded into a rocky shallow off San Juan. The possible damages from grounding will be estimated just after extinguishing of the flames. The fire caused sufficient damages of the vessel’s hull, engineering and cargo on board. The local authorities started investigation for the root cause of the accident. The ship’s position and trace are monitored for oil leaks, but currently there is no report about water pollution. 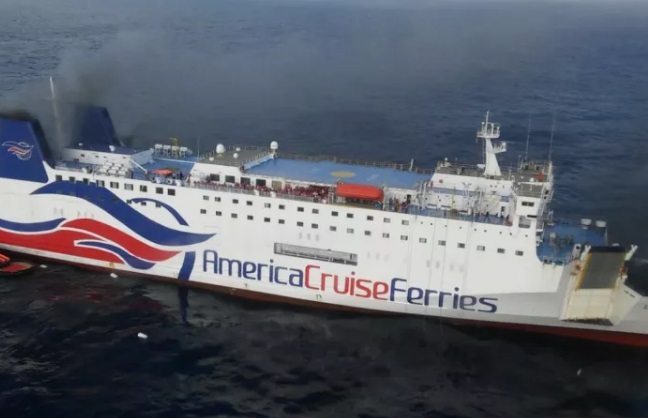 The ferry Caribbean Fantasy (IMO: 8814263) was en route from San Juan, Puerto Rico to Santo Domingo, Dominican Republic and accident happened several minutes after leaving the port. The vessel is making regular voyages on this loop, operated by American Cruise Ferries. The overall length of the ferry is 187.00 m, moulded beam of 28.00 m and maximum draft of 7.50 m. The deadweight of the ship is 6,737 DWT and the gross tonnage is 27,362 GRT. The ferry was built in 1989 by MHI Kore Shipyard and Machinery works in Japan.